Do you have a vitamin D deficiency? Statistics say more people probably do. A March 2009 study published in the Archives of Internal Medicine estimates that 77 percent of all American adults and adolescents have vitamin D insufficiency (less than 30 ng/ml). The estimates are even more alarming for individuals with darker complexions—the darker the skin, the harder it is for the body to manufacture vitamin D—90 percent for Mexican-Americans and 97 percent of all non-Hispanic blacks. 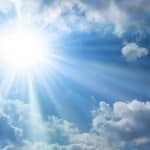 What makes these statistics important is that a vitamin D deficiency is now associated with an increased risk for heart disease, at least 17 types of cancer, diabetes, depression, asthma, lowered immunity, autoimmune diseases, chronic pain, arthritis, osteoporosis, macular degeneration, and multiple sclerosis. Vitamin D is known as “the sunshine vitamin” because the body makes it when the skin is exposed to the sun’s UV-B rays. Dietary intake can counteract a vitamin D deficiency. Although fish is one of the best food sources of vitamin D, the average American eats fish only once every 11 days. There are two primary reasons why most of us have an insufficiency in vitamin D, according to the authors of the Archives of Internal Medicine article. The most significant factor is increased use of sunscreen. Sunscreen with a sun protection factor (SPF) of 15 decreases the synthesis of vitamin D by 99 percent. In addition, decreased outdoor activity and obesity have been associated with an increased deficiency of vitamin D.
Not only do most Americans have a vitamin D insufficiency, but the amounts also appear to be going down, not up. Data from the National Health and Nutrition Examination Survey (NHANES) shows that the average vitamin D level has dropped 6 ng/ml between 1988 and 2004. There is only one way to determine your vitamin D level—a blood test called 25-hydroxyvitamin D. The test is not usually covered by insurance and can cost between $100 and $200. “Insufficiency” is defined by a level less than 30 ng/ml. Vitamin D “deficiency” is a level less than 20 ng/ml. “Toxicity” does not begin until your vitamin D level hits at least 150 ng/ml. Of interest, lifeguards in La Jolla, Calif., have vitamin D levels around 100 ng/ml. The recommended target level for vitamin D is open to debate. Most experts agree your vitamin D level should be at least 30 ng/ml. However, Cooper Clinic recommends patients target 40 ng/ml as a baseline. To help with specific health issues, Dr. Garland’s research indicates a woman drops her risk for breast cancer by 50 percent if her level is 52 ng/ml or greater, and the risk for colon cancer drops in half when the level is 34 ng/ml or greater. One of the best ways to ensure you avoid a vitamin D deficiency is to use supplements such as the Cooper Complete Vitamin D(3) products. Also, you can eat fatty fish like salmon and incorporate some fortified foods such as low-fat milk in your diet. We use Vitamin D(3) in our vitamin D products based on research that it is recognized to be more bioavailable than D(2). How much is needed varies greatly based on age, skin tone, time of year, sun exposure, where you live, weight, and other factors. While Dr. Garland and other researchers recommend a daily oral intake of 50 – 60 mcg (2,000 to 2,400 IU) of D(3) for adults, Cooper Clinic suggests consulting with your physician on what your specific intake should be based on your vitamin D test results, age, and health issues. Vitamin D levels are impossible to predict, so it’s critical to ask your doctor to check it. The odds are your level is lower than it should be. But the good news is it’s easy and inexpensive to correct. Vitamin D and Heart Disease: How are They Linked?